Imagine the setting and context in which these words come to Mary. She and Joseph, fulfilling their calling as faithful Jews, have brought their eight-day-old Child to Jerusalem to be dedicated to God and to be initiated as a child of God through circumcision. Especially in light of Joseph’s and Mary’s harrowing trip from Nazareth to Bethlehem to be counted in a Roman census, their trip to the temple would have been a time of joy and thankfulness to God, a bit like what Christian parents today feel when bringing their children to be baptized. Yet here comes this old man, a party-crasher disturbing their euphoria, giving a disturbing message. Not everyone was going to love their baby, Simeon tells them. Can you imagine a harder message for the mother of a newborn to hear? But Luke explains that this isn't Simeon’s message. Simeon, Luke tells us in verse 25, had the Holy Spirit upon him, the way every person baptized in the name of God the Father, Son, and Holy Spirit does. Verse 26 says that the Holy Spirit had revealed to Simeon that he would not die before seeing the promised King-Messiah. And verse 27 says that Simeon was moved by the Holy Spirit to go to the temple that day. It’s no stretch to say that it was the Holy Spirit Who also incited Simeon to praise God and, taking the Child from Mary, to say that in Jesus, he saw the promised Messiah, Who would come to be light to people from all nations. The King had come and having seen Him, Simeon said, he could now die in peace. And it was also the Holy Spirit Who prompted Simeon to deliver His hard message to Mary. But look here, you might say, guided by the Holy Spirit, messaged by the Holy Spirit, incited by the Holy Spirit...it seems like a bunch of religious mumbo-jumbo. When I hear the power of the Holy Spirit like that, I feel that we’re living in a time like the one in which the boy Samuel, whose story is told in the Old Testament, lived. One night, Samuel heard God speaking to him in much the same way that Simeon must have heard God. But young Samuel wasn’t sure what to make of it because “in those days the word of the LORD was rare; there were not many visions” (1 Samuel 3:1). Why was the Word of the Lord rare in those days? If you read what precedes that verse in 1 Samuel, you realize that God’s people were in the habit of living as though God didn’t exist or that if God did exist, He was some distant, impersonal, and mute deity. But that isn’t the God revealed to Israel and then, to the whole world, in Jesus Christ. The God we know in Jesus is a God Who seeks community and to communicate with those who want Him in their lives. God wants to speak to you and have community with you. “Here I am!” says the God we know in Jesus Christ. “I stand at the door and knock. If anyone hears my voice and opens the door, I will come in and eat with that person, and they with me.” (Revelation 3:20) God wants to talk with you. He wants to spend your whole life with you. This God speaks to us, of course, in His Word in the Bible, in His Word as proclaimed by those who know and follow Him. He speaks to us in the Sacraments of Holy Baptism and Holy Communion. He speaks to us in His Law, where He tells us that when worship anything besides God, take God’s name in vain, dishonor our families or those in authority, commit adultery, gossip about others, steal what belongs to or covet what others possess, we show ourselves to be sinners in need of the Savior. He speaks to us in His gospel in which He assures us that sinners can be made new each day and for all eternity when they repent and believe in the crucified and risen Jesus. But God can also be heard His gentle whispers (1 Kings 19:12) into our spirits as we seek to daily walk with Him. The other night, after I’d brushed and flossed my teeth and before I tossed myself into bed, suddenly, out of the blue, a name crossed my mind. It was the name of a once-prominent person whose name I wouldn’t have remembered if you’d shown me their picture. In fact, after I heard this name in my spirit, I had to look them up on my smartphone to remember what they looked like. Why had I thought of this person? After a time, it dawned on me (I can be kind of slow): This person may have needed prayers and God was calling me to pray. I didn’t need details; I simply needed to pray for them. Someone has said that God the Holy Spirit is a Gentleman: He won't go where He's uninvited. But He will pester God's people--we disciples of Jesus Christ--to issue our prayerful invitations in Jesus' name to intercede in the people's lives for whom we pray. And so, I believe that God was telling me the other night, "Pray for this person, Mark!" It reminds me of a story that Billy Graham tells of a Christian man who was awakened one night by the thought of a single word, a word from some other language, one that he'd never heard nor read. The man was sure that he had to offer up urgent prayers about this word, whatever it was. And so, he did. Then, when he felt at peace that he'd done what God had called him to do, he went to bed. Months later, a missionary on furlough visited the church of which that man was a part. He stood bolt upright when the missionary mentioned the place where he and his family did their work; its name was the same mysterious word that woke the man up one night. He later spoke with the missionary and learned that there had been a terrible crisis at the moment when the Holy Spirit had prompted that man to pray! I know well the power of the Holy Spirit! When I was a little boy, I was close with my great-grandmother. She lived across the street from us and I would visit her every day. She spoke with me as if I were a grown-up, talking with me about politics and history and the God we know in Jesus. Once, when I was about six, she and I stepped outside after a spring rain so that she could check on her flowers. Out on her front walk, she looked to the southeast and saw, over what was then called Jet Stadium, a rainbow. She proceeded to tell me the story of Noah, the ark, and the rainbow of covenant God created to assure the human race that He would never again destroy the earth by water. Years later, I learned that my grandmother's nickname for me was my little preacher. She had neber told me that. But I am sure that as a devout disciple of Jesus who I often found sitting in her rocker reading the Bible, she had sicced the Holy Spirit on me...and here I am today. These are examples of the kinds of things God wants to do through those who seek to dial into Christ, something I don’t do nearly often enough. God wants to use believers as conduits of grace, whether it’s through our prayers in Christ’s name or our witness for Christ’s gospel or our proclamation of Christ’s uncomfortable truth. 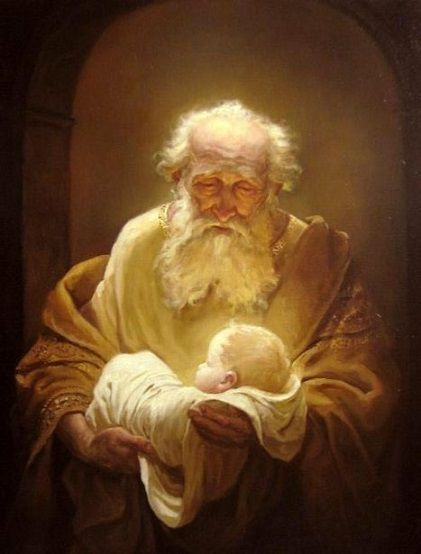 Simeon was so dialed into God and His promise of a Savior that the Holy Spirit rested on him, leading him as he patiently waited for years to see the Christ, then causing him to give voice to what God wanted to tell Joseph and Mary that day in the temple. It was a message they needed to hear lest they fall into the trap of thinking that the baby in their arms was just another baby. A baby, a helpless little baby, would grow to become the cause of falling and rising of many. What does this message from the Holy Spirit mean exactly? It describes two different reactions elicited by Jesus. Some stumble over Jesus and His call to trust in Him so that we can receive forgiveness and life in His name. Others turn Jesus down because they can’t imagine anyone overcoming death and rising again. For many people, Jesus and His gospel are a stumbling block. They refuse to believe in Him. They refuse to be willing to believe in Him. They trip over Jesus and fall away from God for eternity. Our job--our only job as disciples of Jesus--is to keep sharing Him and His good news with people so that they don’t fall. That’s because the God we meet in Jesus doesn’t want any of His children to fall away from Him. God loves every child of earth and wants each one of them to experience the victory over sin, death, decay, suffering, and futility He won for us when Jesus died on a cross and rose from the dead. Jesus wants us to rise! Jesus has come to give us life: full, extravagant, eternal, fulfilling. Jesus has come to give us reconciliation with God, with ourselves, and with those around us. It is all a matter of believing in Him, surrendering in Him, trusting Him to take our sins off of our shoulders when we repent and to set us free when we believe in Him, building our lives on Him alone. This past week, a friend of ours, husband to one of Ann’s childhood friends, died after a painful battle with cancer. We were with his wife on Thursday, about eight hours after he'd passed. Our friend had been through a lot of other painful experiences in life. With those in his background, sometimes, he would ask me tough questions that showed he was wrestling with God. That’s what Jesus Christ was born into this world to give to us. That’s what Simeon had in anticipation of the Savior he saw with his own eyes at the temple. That’s what we can share with others when, like Simeon, we open ourselves to the direction of the Holy Spirit, proclaim Christ, and let Him use us for God’s purposes. The God we know in Jesus is speaking to us; He wants to raise us up, filling us with His life in every aspect of our lives, now and in eternity.